Bea and I just got back from a lovely five days visiting family in California. Since we’re nearing the end of tax season, Frank is gearing up and working longer hours. (Our “home by midnight” rule is being bent…) My mom was heading out anyway to help her sisters and my grandma sort out a transition to her next apartment at an assisted living facility and my dad agreed to fly with me so I wouldn’t have Bea by myself, so it seemed like good timing. It’s always wonderful visiting in the spring – everything is green and in bloom while we’re still waiting on a few late snowstorms before blossoming. My aunt’s house has an amazing hill to explore, so Bea went on many “‘ventures” while we were there. She also got lots of cousin time in, which is always fun! 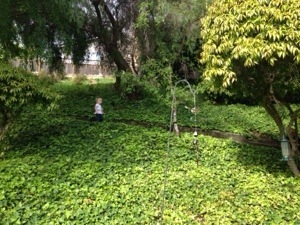 On a ‘venture in Aunt E’s backyard. I read a lot of good books this month! Next on our Reading Challenge was Ayn Rand’s We the Living. I think it’s my favorite of the books I’ve read by her: Shorter (less than 500 pages!) and the most autobiographical. If you haven’t read any of her work, I’d start here. I finally read Luci Shaw after seeing her recommended by various people. The Crime of Living Cautiously was beautifully written and a great challenge. I also read Praying with Icons and am now thinking we need an icon corner in our house. One of my most spiritually moving moments was in a Russian Orthodox church so it was nice to read more about the practicality of using images while praying. This was a month of reading thicker books that were quick reads. Monuments Men was a bit repetitive but such an interesting story I couldn’t put it down. Hopefully we’ll watch the movie, but our track record isn’t great these days… I also read Americanah, on Leigh Kramer’s recommendation and loved it! The story sucked me in and made me think about race and identity. Since my book club is still reading Disunity in Christ, it linked well with themes in that. I’m still reading Girls Will Be Girls slowly – really trying to take my time with it. Next on my nightstand is Bend, Not Break by Ping Fu. Bea has been really into Fantasia and Fantasia 2000 lately, so that’s been on repeat. She loves announcing that she’s ready to listen to Beethoven, even though I think she just means the soundtrack…. I had forgotten what fun movies they are, so it’s been neat reconnecting with old favorites. When I was teaching, I would do a writing unit using Fantasia as an example of creating stories out of music and it’s been so cool listening to Bea retell the stories and add her own little spin. After a discouraging week in social media, Preston Yancey’s reflection was just what I needed to read. I also loved Sarah Joslyn’s A Prayer for Justice over at SheLoves Magazine. (Where, I just found out, I’ve been linked in their March Zine. Pretty cool!) Over here, my own favorite and most popular was Girls. I love springtime in Colorado! One day it’s 70 and sunny, the next, 40 and snowy. Our snow now is the fat, wet, spring snow that looks so pretty with tulips peaking through. We’ve been doing lots of Museum dates but now I’m thinking we’ll transition back to Botanic Gardens dates. We also opened up the backyard sandbox, and Bea would live there if I let her. Probably my favorite time of year! We also finally went to the Wild Animal Sanctuary, a refuge for abused large carnivores. It was a great experience and we’ll definitely be going back. Highlight: Hearing a lion roar as he roamed his compound. Sad stories, but an amazing organization. 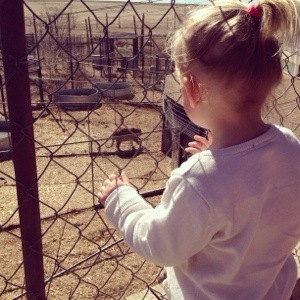 Checking out a tiger at the Wild Animal Sanctuary. Linked with Leigh Kramer’s What I’m Into. Head over there for fun books, activities, and goings-on from March. Glad you were able to spend time with family and glad you enjoyed reading Americanah! I can see how it would pair well with Disunity in Christ.